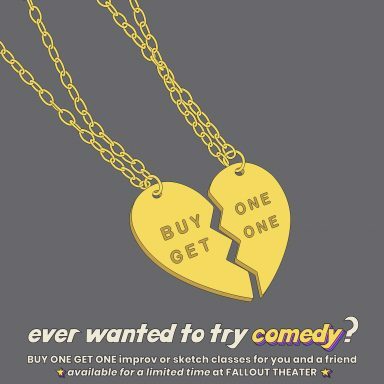 For a limited time only, you can buy 2 spots to any Level 1 Improv or Sketch class that begins in 2019 at Fallout! For $150, you’ll get 8-weeks of quality comedy education from one of Austin’s best schools…for you AND a friend. 1. Buy the $150 BOGO deal from the link below. 2. Check back on our classes page anytime in 2019 to see what Level 1 class works for your schedule. NOTE: We offer many options throughout the year that vary on day of the week and time. 3. E-mail classes@fallouttheater.com from the e-mail address you used to purchase the ticket and include which class you’d like to take, as well as the name of the person taking it with you. Or take two Level 1 classes yourself! Questions? Need guidance? Contact our Conservatory Director Cody Dearing at classes@fallouttheater.com. The fine print: Only valid for Level 1 Improv or Sketch class at Fallout Theater. Class must start in 2019. Non-refundable.